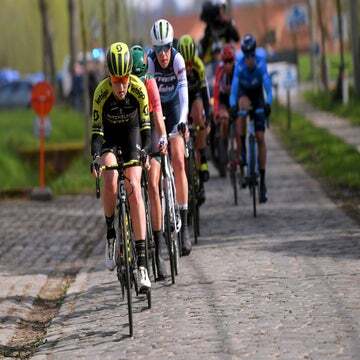 A week after finishing third at Gent-Wevelgem, American Coryn Rivera sprinted to victory at the women’s Tour of Flanders on Sunday. 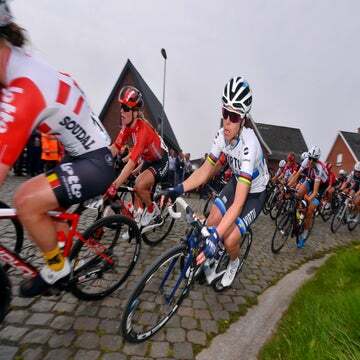 A week after finishing third at Gent-Wevelgem, 24-year-old American Coryn Rivera (Sunweb) sprinted to a sensational victory at the women’s Tour of Flanders on Sunday. 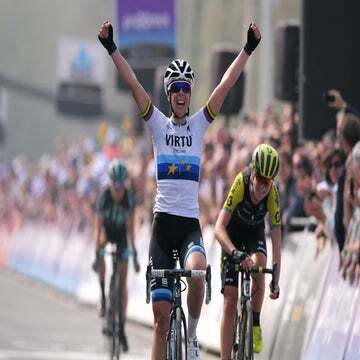 Rivera, who posted her first UCI Women’S WorldTour win at Trofeo Alfredo Binda in March, outkicked two-time Australian road race champion Gracie Elvin (Orica-Scott) and last year’s Gent-Wevelgem winner Chantal Blaak (Boels-Dolmans) in a select bunch sprint in the 153.3km cobbled classic – the longest race of the WWT this season. After what appeared to be a potential four-rider break racing to the finish uncontested with 30km remaining, a chase group of 15 was able to ride down Elisa Longo Borghini (Wiggle-High5), Anna Van Der Breggen (Boels-Dolmans), Katarzyna Niewadoma (WM3 Energie) and Annemie Van Vleuten (Orica-Scott) shortly after ascending the Patersberg, which marked the final climb of the day, to set up the hotly contested sprint finish. “The team did a brilliant job keeping the leaders safe and in a good position throughout the race. When the going got tough the team animated the race with Rozanne taking a lead before the Kanarieberg,” said Rivera of her teammate Rozanne Slik’s solo attack at the 100km mark. “Here we showed our intentions to make it a hard race and when the first bunch of 30 exploded on the Kruisberg, we were up there but we couldn’t follow on the climb. The team gave everything on the Kwaremont to get the group back at the wheel and we almost closed it, but in the end we couldn’t follow the four best climbers. For Elvin, who tactically tucked into the chase group and eventually battled Rivera for the win, the second-place result was bittersweet and credited her Orica-Scott teammate who finished fourth. Rivera is scheduled to race Amstel Gold Race on April 16 next.